This Sunday is both Mothers’ Day (in the UK) and Mothering Sunday, and these are not different names for the same thing. 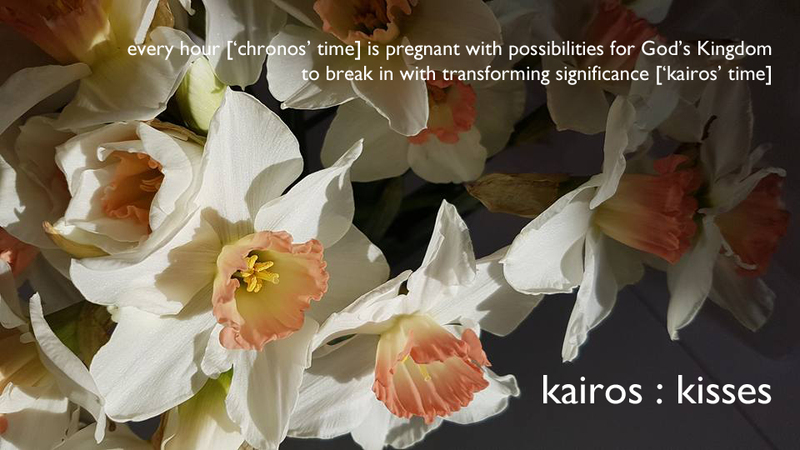 Mothers’ Day relates to our mothers, biological or otherwise. Mothering Sunday is the annual thanksgiving for our mother church, the local church where we were baptised, the community of faith that nurtured our faith. My mother church is St Mary’s Broadwater, far distant on the south coast. I was baptised there when my parents were on furlough from the Philippines. I have never attended that church; but every day of my life, members of that congregation have prayed for me—just as my mother has prayed for me every day of my life. Some of them only met me as a baby; some remember me from summer visits as a small boy; some have left this life to enter the nearer presence of God, joining the great cloud of witnesses who cheer me on. Some have never met me, but have had the baton passed on to them by those who did. The primary work of love—before and beyond all other forms of nurture, however essential—is prayer. 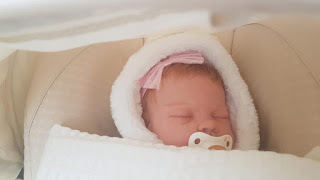 The primary work of a mother and a mother church is to pray for her children, from before they are born and long after they have grown up and left home; even to her dying breath. Even mothers who do not believe in God carry their children in their thoughts, at once within and somehow mysteriously beyond themselves; and that is prayer. This Sunday I cannot be with either my mother or my mother church. But I will give thanks for both. Their prayers have sustained me, and, in ways we will never know, shaped me towards who I am, and am becoming. 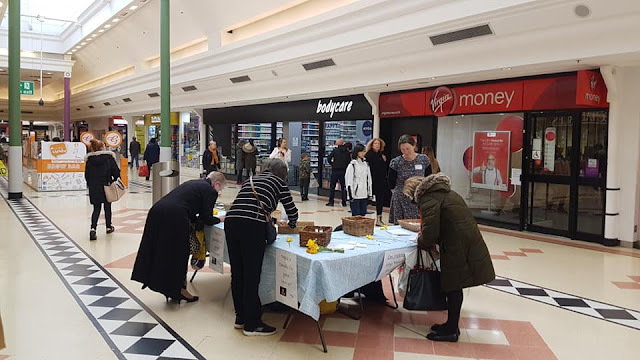 Yesterday, for the third year running, members of Sunderland Minster spent the day at a stall in the neighbouring shopping mall. 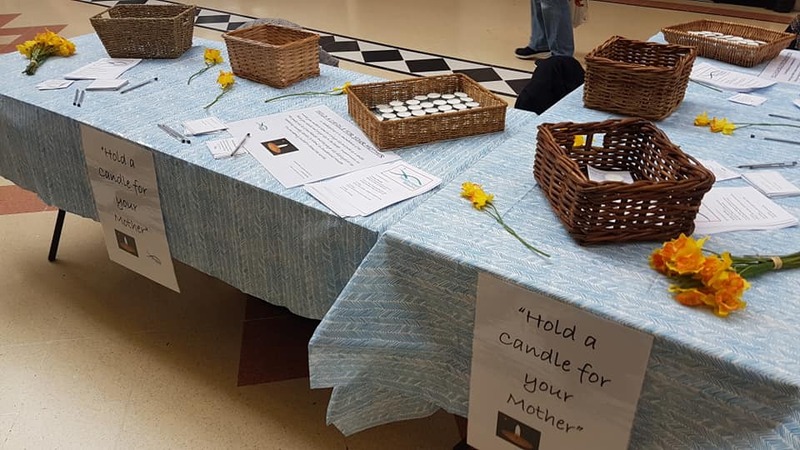 Ahead of Mothers’ Day this coming weekend, we were there to hold out the invitation to mark the occasion by writing a message of appreciation or a prayer, and placing it, along with a tealight, in a basket. 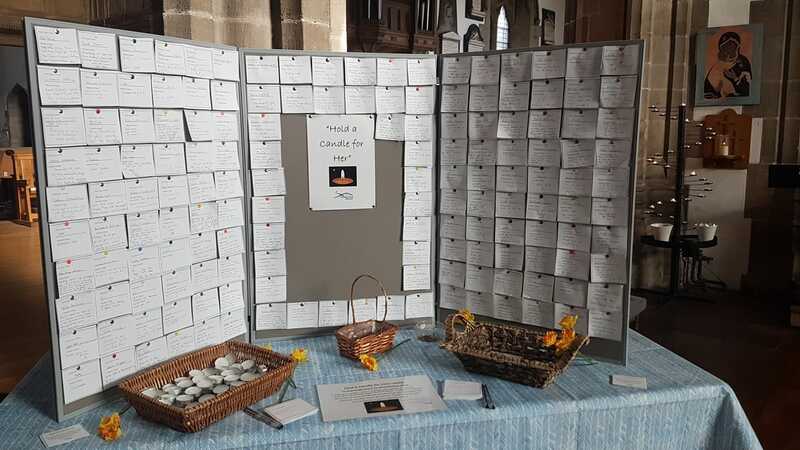 The messages would then be displayed at the Minster for a whole week, while the tealights will be lit at our morning service on Mothers’ Day itself. I find engaging people I don’t know in conversation particularly hard (and instead of approaching people, I quietly pray, asking God to send people to me). Yet each time we do this, it seems to meet a need. For me, the highlight is the many often deeply personal and moving conversations I get to have over the course of several hours simply being purposely present to those neighbours Jesus calls us to love as we love ourselves. I found myself thankful for the opportunity; for the people God sent our way; and for the fabulous team from the Minster who took turns on the stall. Is there something we can learn here? I find this interesting because so many people in my own culture live with anxiety and depression, and face overwhelming grief for a thousand different things, caught up, as we are, in ‘the collateral damage of life’ (Pavlovitz). I find it challenging in regard to the extent to which Christians in this nation do not evangelise; and in regard to the extent to which those who have journeyed within the pilgrim people of the Church have not experienced noticeable transformation, in either the lives of their fellow-pilgrims or their own—and so, in many cases, have walked away. I am convinced that God has sent these Iranian sisters and brothers to England because we need to learn from them. I believe that one day it will be safe for them to return home. But not, I believe, until God has done through them the purposes for which he has brought them here in the first place.